Many people think that the Northern Lights only occur in the Northern Hemisphere. For that is false by pure and simple physics. All planets (or satellites) with “strong” magnetic field and atmosphere, and that suffer or are struck by a star suffer auroras. The auroras, as you will know because I have repeated it a hundred thousand times or more, is the excitation of the gases of the atmosphere is due to the energetic particles that collide oriented by the magnetic field of the planet. That is to say, the magnetic field is a “guiding / conducting” of the energetic particles charged of the star. Remember that the particles are charged both positively and negatively and so can go to the different magnetic poles or, rather, are attracted by the different magnetic poles (the two there, let’s go). 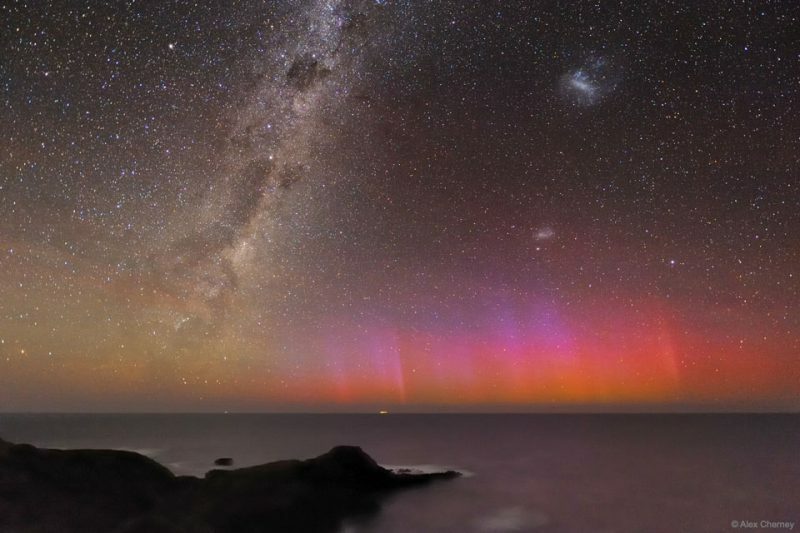 That is why, in the image you can see an aurora in Australia, in the “southern hemisphere”, something that, for many, is impossible since they associate it with Nordic countries (false thing). At the beginning of January there was a strong solar explosion (and no, it has not risen, as the abnormal ones that associate climate change with the Sun’s stadiums) say that, from this May and for about 3 months, will be lashing the Earth showing auroras like the one you see in the image. So, in particular, I recommend a trip to a place where you can see auroras and, for those months, you will have an insured show.